GSCR team is Awesome . We have rented from them previously and have loved every cabin we have stayed in! We were very impressed by the response of the GSCR staff. We loved this location and the decor of the cabin. We celebrated our 50th wedding anniversary. We enjoyed the cabin and went tubing, rafting and horseback riding. The cabin was great, we appreciated the kid friendliness with baby gates, toys, and kids books. We came for the Polar Express. The cabin was great! Lots of laughs and great memories made. We discussed making this an annual friends trip! Fast and efficient; The cabin was very clean, well stocked and had comfortable beds. The views are outstanding. We had a wonderful time! Loved the cabin! We'll definitely be back. We had a wonderful time! Loved the cabin. We'll definitely be back. This cozy cabin was better than expected. The cabin is equipped with everything you could need during your stay. 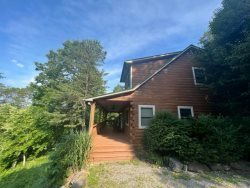 Very private in wooded area yet still close to Bryson City and surrounding attractions. Highly recommend. Whispering Woods is a wonderful house, in an incredible setting. The Nantahala area is just idyllic, and so much fun. We had a wonderful time, and we are really thankful to our hosts for being so flexible with the changes in our schedule. WE felt so at home! Great Cabin for three generations. The cabin was greatly equipped. Screened in porch was great for the kids. Re rented two cabins for a family reunion. We made many wonderful family memories. Thank you! Team was friendly and responsive to any concerns we had. Great Week at the cabin. Online pictures do not do it justice. We had a fun week in and around Bryson City. Thank you! !